Driving the road nr.1 or the ring road in Iceland is great fun and the beautiful sights on the way are sure to take your breath away. We have decided to blog about driving on the ring road in an attempt to clarify for travelers what they might expect (with emphasis on the driving part). These blogs are not a list of all the sights you can see in the area, but rather an idea of how you might expect the roads to be, road sections to watch out for and how the weather can affect your trip. So put on your virtual seat belt and let’s finish our ring road journey on road 1 in West Iceland. West Iceland, from Holtavörðuheiði to Reykjavík (with Snæfellsnes peninsula). Driving time without stops: Only road 1 about 3 hours. The drive around Snæfellsnes peninsula is about 6 hours. Asphalt and gravel roads (road 1 and secondary roads on Snæfellnes peninsula). Roads: 1 and 54. Safe for all cars to drive (2wd and 4wd). For the purpose of this blog, we have decided that West Iceland is from Holtavörðuheiði mountain passage to Reykjavík city. However, you can't miss out on the amazing Snæfellsnes peninsula so we have included that as well. The Snæfellsnes peninsula part of the way has many secondary gravel roads, but the road 1 in the area is all asphalt. And we are off! From Hrútafjörður we take the long, slow climb up the mountain towards Holtavörðuheiði mountain passage. Don´t let the view fool you, this mountain passage can be quite fierce in fall, winter and spring. Even in the summer too. And you can not just look up the mountain and think to yourself "Oh, that does not look too bad", no, no, no. We urge you to check the weather and road conditions and ask the locals, especially if you are traveling in winter, as the weather can be much worse than what you see from down below. Holtavörðuheiði in summer, you can travel it yourself courtesy of Google maps. Holtavörðuheiði in winter in what the owner calls beautiful weather and great road conditions. Once you have passed over the mountain you are in the lovely Borgarfjörður fjord, which stretches quite a ways inland, and that´s where you are. If you plan to skip Snæfellsnes peninsula you will drive on through the beautiful village of Bifröst where the landscape is out of this world. The drive to the town of Borgarnes takes less than an hour. You will pass through Borgarnes whether you drive the Snæfellsnes peninsula or not, so you can skip on to the part about Borgarnes if you plan to skip it. The detour off road 1 to the lovely Snæfellsnes peninsula starts when you turn right on road 60, the sign says Búðardalur. You will pass over Brattabrekka which literally means The Steep Hill so there is full reason to be cautious if you are traveling in winter as can be seen below. This is also the road to the West fjords region. Google map of the turn in the road to Snæfellsnes. Photo of Brattabrekka by Vísindavefurinn. The next turn is when you turn left onto road 54. You are now in Snæfellsnes and will be on this road until you reach Borgarnes and road 1 again. The first part of the road is a gravel road and not a very good one. The view over Breiðafjörður fjord might make up for it though. The road improves once you get to the village of Stykkishólmur and we strongly suggest you visit this lovely, relaxed village. The ferry, Baldur, goes over to the south side of the Western fjords and by the wonderful island, Flatey. If you are thinking about driving to the Westfjords, the ferry might be a great option for you. The road improves after we pass Stykkishólmur to a nice, although a little bit narrow, asphalt road. You can find several self drive guides around the Snæfellsnes peninsula, such as here and here. We are just going to point out the most obvious sites in the tips below. Just outside the village of Grundarfjörður, you will find the spot on the photo to the right with Mt. Kirkjufell and the little waterfall. Believe it or not this combo is now the most popular photo op in Iceland so if you are up to touristy sites than this one is for you. The Snæfellsjökull national park is named after Snæfellsjökull, a small glacier located at the end of the peninsula. The view from the road is amazing all around. Stopping at Hellnar, Arnarstapi and Dritvík is awesome, highly recommended. Just a little past Arnarstapi you can drive up to the glacier, this is only possible in summer if the gravel road is open. There are tours on the glacier of course, buy your ticket at Arnarstapi and journey to the center of the earth. The southern peninsula is stunning on the way back to the ring road with its beautiful mountains and black beaches. The crater Eldborg, pictured above, is a dominant factor in the landscape, personally one of my favorites. You can walk up to the crater if you fancy that sort of thing. Eldborg marks the end of the peninsula as you slowly make your way back to road 1. The road continues to be a nice, narrow asphalt road for the rest of our journey to Reykjavik. Back on road 1 we arrive in the town of Borgarnes. This cute town is mostly used to stop at the gas stations, but it has more to offer. If you are traveling with your family, we suggest you check out the playgrounds at Bjössaróló, the surrounding area is great for a stop and a little break from the car. The Settlement center is close by, if you are into the Icelandic Sagas, that is a must stop. The swimming pool is also great. The photo on the right is from the heart of Borgarnes, walking distance from all the places mentioned. We only have about an hour left to drive from Borgarnes to Reykjavik, the end of the ring road. The drive is beautiful. Be aware that as you approach Reykjavik, traffic on this road gets heavier, especially in the summertime. A fun fact, all the rivers you drive over are salmon and trout fishing rivers and quite popular ones. You will need a permit to fish in these rivers and that can be very pricy depending on the river. As you leave Borgarnes towards Reykjavik you will cross the Borgarfjörður bridge and drive by Hafnarfjall mountain, seen on the photo to the left above. Hafnarfjall is notorious for bad weather, if there is any kind of wind in the South-West region, this is where it is at its worst! There is a sign right after you cross the bridge with information on the weather under the mountain (yes, that is how bad it is). The sign is in Icelandic but it shows the wind speed (meters/second) and if there are no red numbers you are fine. If there are red numbers just be aware and drive slowly, if the numbers are above 30 m/s you might want to wait it out or at least check the road conditions. The sign also has information on the wind speed at Kjalarnes which we talk about below. We reach the tunnel under the Hvalfjordur fjord. The tunnel is 5770m long of which 3750m are beneath the ocean, with the lowest point at 165m below sea level. It takes about 5 min to drive through the tunnel. It costs 1000 ISK to pass which you pay at the toll booth on the left when you reach the tunnel on the north side of the tunnel. 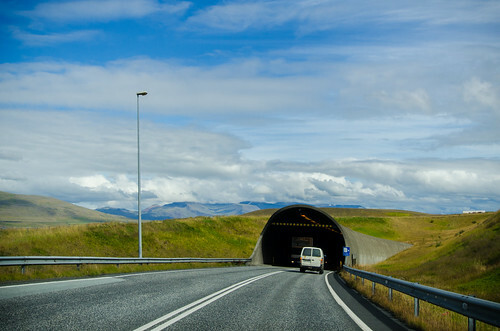 When you are driving from Reykjavik, you first drive the tunnel and then pay for it on the other side. The speed limit in the tunnel is 70 km/h but most people drive slower, no need to hurry through here people. Just remember to roll up your windows and switch the air con from outside air to inside air for the duration of the tunnel as the smell down there is not good. The tunnel shortens the trip from south to west by 1 hour and 15 minutes. However, I want to point out that Hvalfjörður fjord is actually beautiful and well worth the drive if you are not in a hurry. If you are interested in fjords, Hvalfjörður is the closest one from Reykjavik. The highest waterfall in Iceland, Glymur, is at the bottom of the fjord. Once we leave the Hvalfjörður tunnel behind us and have turned the air con to outside air again, we are on our way to the small village of Kjalarnes. This is another windy spot as you can see by the fact that all the trees here are tilted to the side, as they have no place to hide from the wind that can be quite strong in the area. You can see Reykjavik from Kjalarnes, and the view can be very beautiful, especially the city lights at night in winter, with Northern lights perhaps. You can check out the sites of the Icelandic Met office (go to Station forecasts) to check the weather and the Icelandic Road Administration to check road conditions and webcams all over the country. I wrote a blog about driving in Iceland a while back and it includes info on how to use these sites. You can find other blogs I have written about driving in Iceland, they contain useful info and links to good sites. We remind you that the speeding limit is 90 km/h on asphalt roads and 80 km/h on gravel roads. The speeding limit in towns is 50 km/h. The police frequently checks speeding in the area and there are a lot of speeding cameras so we advise you to respect the speed limit. Also, please be aware that off-road driving is against the law in Iceland as it causes real and irreversible damage to the Icelandic nature that could take decades to heal. Please do not drive off roads even if you see tire tracks! Wow, we have completed the ring road. We hope you enjoyed the ride with us, read all about it in the related blogs below. We have not finished exploring Iceland though, and will also be going to the Western fjords and Reykjanes peninsula. Stay tuned for the continued journey through the rugged Western fjords soon.